John J. Mearsheimer in Why Leaders Lie: The Truth About Lying In International Politics (2011) explains why leaders engage in fear mongering. Mearsheimer declares that leaders engage in fear mongering when they think they recognize a serious threat to national security that the public does not see, and that the public cannot be made to appreciate with straightforward and honest discourse. They reason that the only way to mobilize their citizens to do the right thing is to deceive them for their own good. Fear mongering, which is a straightforward top-down form of behavior, is antidemocratic at its core, although leaders do it because they think it is in the national interest, not for person gain. There are number reasons why average citizens might not be able to comprehend a particular threat. They might not be sufficiently interested in international affairs to appreciate that their country is facing a lurking danger, even when their leaders give them unvarnished evidence of that threat. It is much harder to argue that educated elites who dispute the seriousness of a threat are either ignorant or dim-witted. This is especially true when you are dealing with experts on the issue at hand. It might be the case, however, that those educated and interested dissenters are perceived to have a wish-washy view of international politics, and therefore some threat inflation is necessary to stiffen their backbones. It might also be the case that they are simply misreading the available evidence about the danger facing their country and drawing overly optimistic conclusions about the threat environment. If leaders cannot solve this problem by providing the misguided dissenters with more detailed information, the only solution left is fear mongering. Vladimir Putin and Ukraine’s leader meet. We’ll look at Russia and the high voltage chess game over Ukraine. Plus, we look at potential US military strikes in Syria and Iraq. Ukraine’s president sat down with Vladimir Putin yesterday, and was not shy about putting Russia’s tensions with Ukraine in the most dramatic terms. The fate of Europe and the fate of the world are being decided here, he said. But not quickly. 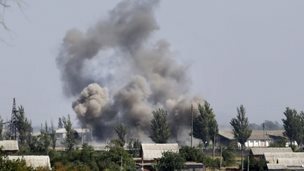 Ukraine blasting separatists in the east. Separatists parading, abusing Ukrainian POWs in public. Russian troops captured inside Ukraine. War talk. And the biggest East-West crisis since the Cold War. This hour On Point: the dangerous chess game over Ukraine. Plus – we look at the US lining up its bomb sights on ISIS in Syria. George Friedman in The Next Decade: Where We’ve Been … And Where We’re Going (2011)writes that the Ukrainian election in 2004 marked a turning point in U.S. and Russian relations. President Viktor Yanukovich, the winner was accused of widespread electoral fraud. Demonstrations took placed demanding that the election be annulled, that Yanukovich step down, and that new elections be held. this uproar, known as the Orange Revolution, was seen by Moscow as pro-Western, anti-Russian uprising designed to take Ukraine into NATO. The Russians also charged that rather than being a popular uprising, it was a carefully orchestrated coup, sponsored by the CIA and the British MI6. According to the Russians, Western non-governmental organizations and consulting groups had flooded Ukraine to stage the demonstrations, unseat a pro-Russian government, and directly threaten Russian national security. Certainly the Americans and the British had supported these NGOs, and the consultants who were now managing the campaigns of some of the pro-Western candidates in Ukraine had formerly managed elections in the United States. Western money from multiple sources [including George Soros] clearly was going into the country, but from the American point of view, there was nothing covert or menacing in any of this. The United States was simply doing what it had done since the fall of the Berlin Wall: working with democratic groups to build democracies. Friedman writes that terrorism is normally undertaken in lieu of more effective action. 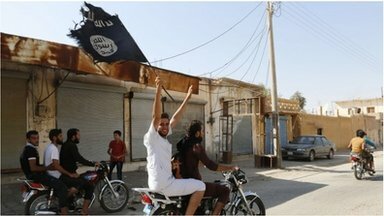 Al Qaeda, [like its spawn ISIS], wanted to convince the Islamic world that it was so powerful it was the most important thing on American minds. Al Qaeda achieved that goal. By declaring a war on terror, the United States signaled that it regarded this single threat as transcending all others. Protecting the United States against terrorist acts became the central thrust of American global strategy, consuming enormous energy and resources. But terrorism as practiced by al Qaeda [or ISIS] does not represent a strategic danger to the United States. It can and at times will kill perhaps thousands of Americans, and it will cause pain and generate fear. but terrorism in and of itself cannot destroy the material basis of the American republic. Because terrorism—even including nuclear terrorism—does not represent an existential threat to the United States [nor Israel] a foreign policy focused singularly on terrorism is fundamentally unbalanced. The lack of balance consists of devoting all available resources to one threat among many [including the economic health and domestic civil unrest] while failing to control other threats that are of equal or greater significance and danger [of destabilizing the republic]. This is not an argument to ignore terrorism, but rather an argument that terrorism needs to be considered within the context of national strategy. this is where George W. Bush got trapped, and his successors run the risk of falling into the same snare. The UN accuses IS militants of war crimes, and the Syrian government of using chemical agents in eight separate incidents in a new report. Did inaction foment regional chaos? 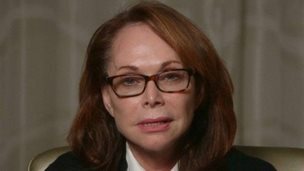 The mother of US journalist Steven Sotloff, held hostage by IS militants, pleads with his captors to release him in a video appeal. Pro-Russian separatists in eastern Ukraine push their way into the port of Novoazovsk, threatening to open up a new front in the war. According to the Los Angeles Times the late Libyan dictator Muammar Gaddafi had “secretly salted away more than $200 billion in bank accounts, real estate and corporate investments around the world before he was killed.” The story was repeated around the world, with various news sites reporting that Gadhafi died richer than the three richest people on the planet – Carlos Slim, Bill Gates and Warren Buffett – combined. This means, prior to his death, he was by far the richest person in the world. Currently, he has an estimated net worth of $70 billion. His forty-two year reign was subject of much controversy and internal unrest. As of February 2011, political unrest within the country boiled over into full-scale violence, largely perpetrated [and encourage by the French and] by the military against civilian protesters. [After giving up his nuclear weapons aspirations] Gaddafi was forced out of office [by the union of former European colonizers, now calling themselves the International Community and the United States] and eventually assassinated by rebel forces. David Greene talks to David Kirkpatrick, a correspondent for The New York Times, which reported that Egypt and the United Arab Emirates collaborated on airstrikes against Islamists in Tripoli. Libya's violent and chaotic slide toward civil war now has two new players. The New York Times is reporting that Egypt and the United Arab Emirates collaborated on airstrikes against Islamists in the Libyan capital, Tripoli. And apparently the United States had no idea this was happening. We reached the New York Times Cairo bureau chief, David Kirkpatrick. David, good morning. GREENE: So tell me what you know about these airstrikes. KIRKPATRICK: Well, we know that they were carried out by the United Arab Emirates from bases in Egypt. And we know that both governments, at best, tried to keep those strikes secret and behind-the-scenes. Egyptian actually lied about it to the American government. So this is quite a subject of intrigue here in Egypt, in the Gulf and in Lybia. GREENE: OK. A few questions come to mind after hearing you talk about that. The first is why do these two countries want to hit these Islamist militants in Libya? In the December 20, 2010 issue of Forbes Magazine there was a 20 layout featuring Muammar Gaddafi and his eldest son, Seif al-Islam, in which they told of their plans to diversify Libya’s economy. This combined with the fact that Gaddafi had given up his WMD led directly to his death. Unlike North Korea, he believed the West had his best interest at heart. American Eric Harroun threatened Bashar Assad on Facebook and YouTube. He spent six weeks fighting with a rebel army, a journey that did not end well for him. The heyday of "war tourism" was probably the 1930s, when a host of intellectuals and artists left the U.S. to bear witness to the Spanish Civil War. Ernest Hemingway wrote about it. George Orwell, just to name another, actually fought in it. Regular people from all walks of life showed up on those fields of battle as well, in much the same way young men — both Muslim and non-Muslim — are streaming to Syria today. The modern-day result: Instead of newspaper articles and Orwell's boook, Homage to Catalonia, there are literally hundreds of Facebook entries that chronicle the fight. Some, like this one from former Army Pvt. Eric Harroun, seem a bit naïve. "Bashir al-Assad your days are numbered, you're going down in flames," Harroun posted on his Facebook page last year. "You should just quit now while you can and leave ... you're going to die no matter what ... where ever you go we will find you and kill you." U.S. intelligence officials tracking American fighters believe that at least 140 of them have gone to fight in Syria and Iraq so far. They say the number of U.S. passport holders now in the fight has more than doubled since the beginning of the year. In August 1914, the five great powers of Europe declared war on one another. For countries like Britain, Germany and France the significance of World War One is regularly debated and commemorated. But what of that other great power, Russia? It also fought against Germany, but by the end of the war Tsar Nicholas II and his family had been murdered and the Bolshevik Revolution had brought Lenin to power.How far does what was happening in Russia then, help explain what is going on today? Zeinab Badawi talks to the renowned Russian theatre and film director Andrei Konchalovsky. NATO is sixty five years old – does it lack the vigour, resources and political will to be an effective military force on the world stage at a time when conflicts across continents in Iraq, Syria, Ukraine and West Africa present ever greater dangers to global security? HARDtalk speaks to NATO’s Secretary General, Anders Fogh Rasmussen. Can NATO make the world a safer place and, if not, is it time the alliance went into retirement? As the world commemorates the start of the First World War, HARDtalk travels to Sarajevo, the capital of Bosnia Herzegovina, to speak to Karl von Habsburg - grandson of the last of the Habsburg emperors. It was in Sarajevo that his great uncle Archduke Franz Ferdinand was assassinated in June 1914, an event which set the Great War in motion. Stephen Sackur hears reflections on Europe then and Europe now. HARDtalk is on location in Chisinau, capital of Moldova where the stage is set for another tug of war between Russia and the European Union. With the backing of the majority Romanian speaking population Moldova’s government is vigorously pursuing membership of the European Union despite strong objections from the country’s Russian speaking minority. Stephen Sackur asks Iurie Leanca, Prime Minister of Moldova, if his country can avoid the fate of neighbouring Ukraine? George Friedman writes that the Ukrainian election in 2004 marked a turning point in U.S. and Russian relations. President Viktor Yanukovich, the winner was accused of widespread electoral fraud. Demonstrations took placed demanding that the election be annulled, that Yanukovich step down, and that new elections be held. I speak a number of languages, English being my mother tongue and I cannot for the life of me, make sense out of the second sentence. What I'm seeing is that politicians fearmonger because there's a threat the public cannot comprehend and that the only way to make them comprehend is to magnify the threat. This is absolute nonsense.